Emporio Armani presents a simple watch design for fans of all things minimalist. With monochromatic colour styling, a black textured dial and a date aperture at the 3 o'clock mark, you can wear this piece as an everyday accessory. 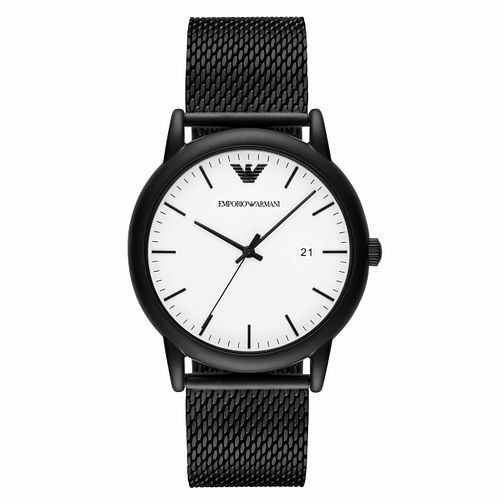 Emporio Armani Men's Stainless Steel Black Bracelet Watch is rated 3.7 out of 5 by 3. Rated 2 out of 5 by Anonymous from This product look smart and sleek to wear This is a nice product but unfortunately have to return to the store the next day to get the battery replace which take 6 week. It's a disappointment coz its a brand new watch and the battery is not working. Rated 4 out of 5 by Anonymous from Really good product This watch is reallly good and would definitely recommend to anyone.